Extensive special effects surrounding certain aspects of the film, such as the lava and pyroclastic flows, were created by Digital Domain, Banned from the Ranch Entertainment and CIS Hollywood. The computer-generated imagery was mostly coordinated and supervised by Patrick McClung, Roy Arbogast, Lori J. Nelson, Richard Stutsman and Dean Miller. Although the film uses considerable amounts of CGI, the volcanic ash in the film was created using cellulose insulation manufactured by Regal Industries in Crothersville, Indiana. Between visuals, miniatures, and animation, over 300 technicians were directly involved in the production aspects of the special effects. 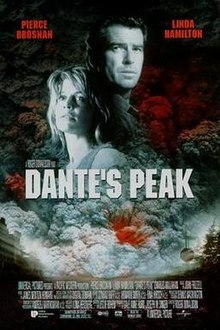 Despite the complexity of its visual effects, Dante's Peak was not nominated for an Academy Award for Best Visual Effects that year, as it faced stiff competition from Titanic, The Lost World: Jurassic Park and Starship Troopers. This page was last edited on 11 April 2019, at 06:31 (UTC).